As a news hound I have had the growing protests against Sharia law that have been cropping up around the United States recently. Apparently there are a lot of people who think that there is an effort to impose this law on the citizens of this country and these people also think that if there is no protest against the efforts to impose Sharia law on us would succeed. A short debate I got into with one of my followers has caused me to look more thoroughly into this issue. She linked an article about a man who walked into the home of his daughter and shot her in the head. As it turns out this was because he felt she became too “westernized” and that the shooting is what is commonly referred to as an honor killing. It is not the first time this kind of criminal act has been in the news. There have been ficitional episodes that dealt with this subject. What this man did was clearly against US law and he has been charged with murder. Since the majority of people in this country would clearly be against imposing Sharia law on them and our constitution would clearly probhibit the imposition of what is obviously a religous belief system upon us, that people who were protesting against Sharia law were either wasting their time or engaging in Islamphobia. My follower seems to believe otherwise. It is her strong opinion that there is an intense effort to impost Sharia law upon the citizens of the United States and has urged me to at least look at both sides of the issue. Sharia law is the law of Islam. The Sharia (also spelled Shari’a or Shariah) law is cast from Muhammad‘s words, called “Hadith,” and actions, called “Sunnah,” and the Quran. Sharia law itself cannot be altered, but the interpretation of Sharia law, called “Fiqh,” by imams is given some latitude. 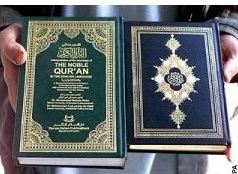 • Criticizing or denying any part of the Quran is punishable by dea†h. • Criticizing Muhammad or denying that he is a prophet is punishable by dea†h. • Criticizing or denying Allah is punishable by dea†h (see Allah moon god). • A Muslim who becomes a non-Muslim is punishable by dea†h (Compulsion in religion). • A non-Muslim who leads a Muslim away from Islam is punishable by dea†h. • A non-Muslim man who marries a Muslim woman is punishable by dea†h. • A girl or woman who has been raрed cannot testify in court against her raрist(s). • Testimonies of 4 male witnesses are required to prove the raрe of a girl or woman. • A girl or woman who alleges raрe without producing 4 male witnesses is guilty of adultery. • A girl or woman found guilty of adultery is punishable by dea†h (see “Islamophobia“). • A man convicted of raрe can have his conviction dismissed by marrying his victim. • A woman cannot drive a car, as it leads to fitnah (see Errors in Quran). Now this last one got my attention because there is another religon that does close to the same thing. The representatives are usually those with white shirts and black ties that come banging on my front door when I am trying to take a nap. Now as I said before, I believe these laws would not make it into our legal system simply because of the severity of them. They also go against the beliefs of the majority of us in this country. Again, however, there are those out there who think it is possible for this to happen and for that reason I have decided to look into this in depth and make my impressions known here. Sharia law isn’t all rainbow & unicorns. This is not about denying ones religious rights either.. Most of the Muslims who want to bring Sharia Law here is MEN. Ask a man why.. see what answer you get.